Clubs in the English Football League will stream Saturday afternoon matches live online in the UK and Ireland for the first time this weekend. Games are ordinarily blocked from being shown between 14:45 and 17:15. But usual broadcasting rules do not apply for international breaks because of Uefa regulations, which the EFL says have not changed for this season. 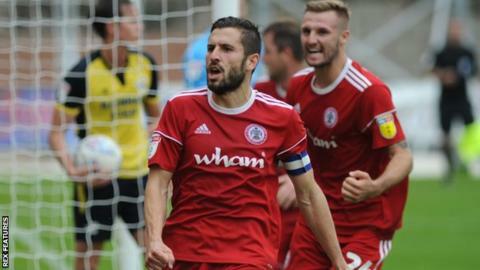 Accrington Stanley chairman Andy Holt said he is "angry and dismayed" that matches are allowed to be shown. The Football Supporters' Federation (FSF) described the usual blackout as a "tool to protect lower-league clubs" and that it is "disappointed" games would be streamed this weekend. The EFL said it is "very aware of the importance of protecting the live matchday experience and will always champion supporters making their way through turnstiles as the best way to watch live football". It added: "The option to stream is an added option for those fans who can't make the game in person. The matches taking place tomorrow (Saturday) will help determine the future direction of travel so we can fully understand what games will be eligible for domestic streaming from 2019-20." The EFL offered the streaming service to UK-based fans for the first time during a round of midweek fixtures in August, allowing supporters to view a match for a fee of £10 via their club's digital platform iFollow. iFollow is used by 58 of the EFL's 72 clubs, and streams of matches have been available to overseas supporters since last season. However, EFL clubs will be able to stream games on 8 September, 13 October, 17 November 2018 and 23 March 2019 when Uefa fixtures are being staged during international breaks. After Holt posted a series of tweets on Friday criticising the EFL, Accrington released a statement saying the details of Article 48 - the Uefa regulation that allows 15:00 BST kick-offs to be shown during the international break - were "never brought to light". "While Mr Holt accepts that EFL member clubs were written to at the beginning of July, the broadcasting exceptions during the international break were not made available for debate or agreed upon at the summer conference," said the statement. "As a member club of the EFL, Accrington Stanley expects detailed information concerning any changes to rules that directly impact upon the club, and Mr Holt expects a full and proper debate followed by a vote on substantive issues such as this." He had also earlier claimed that several other EFL clubs, including Bury, Morecambe and Oldham Athletic, were unaware of the development allowing matches to be streamed. In a statement, the FSF said not broadcasting games at 15:00 BST is "part of the tradition of English football" and "crucial to the economic survival of many clubs lower down the football pyramid". It added: "This has been implemented without any consultation with supporters and the FSF will be raising the issue with the EFL directly."